True to its vision, “Tee-Off With Mother Nature”, the brand new Labuan International Golf Club (LIGC) is set amidst over 200 acres of lush landscapes and natural surrounds in Federal Territory Labuan. Any golfers who visits will be guaranteed to appreciate both the challenge and the mesmerising scenery. The par 72 golf course was designed by renowned Australian designer, Parslow & Winter Golf Course Design. We guarantee Golfers will be fascinated with the challenges provided by the golf course, comments Abdul Razak Abd Samad, Club General Manager. 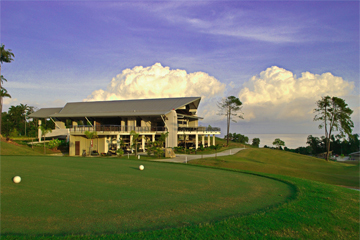 Proudly owned by Labuan Corporation, LIGC is the only 18-hole golf course in Labuan. The Club has commenced its operations since August 2013, the Club is fast becoming the golfing destination of choice amongst the golfing fraternities of Borneo. The simple yet functional clubhouse provides all the basic necessities for one to rejuvenate after a round of golf. The Club also boasts a first class practice facilities with 16-bay driving range, practice greens and a bunker. Managed by Kelab Pengurusan Golf Perbadanan Labuan(KGPL) for Labuan Corporation and with the future planning of other property developments within the golf club vicinity (hotels and residential area), it will be expected to complement the fast growing Oil & Gas Industry and the Off-shore Financing which Labuan is currently famous for.